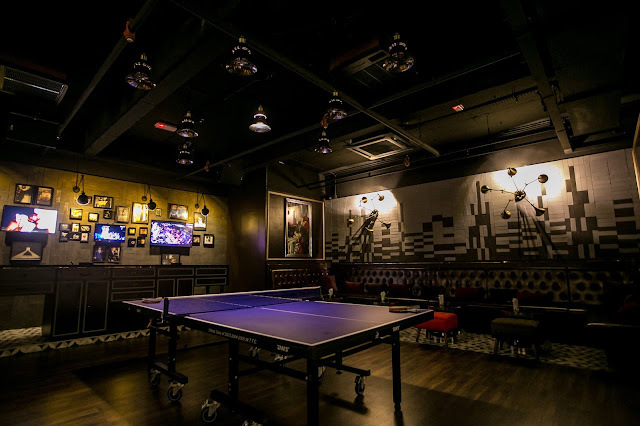 Speakeasy bars is certainly quite rare in Malaysia. There are only approximately 5-7 speakeasy bars in town, which is spread across Klang Valley. CHAZE at Marquee being one of them, has just recently opened its doors to the public roughly a month + ago. Located in Menara Lien Hoe, finding it is fairly simple, despite it being rather new. Simply go on their Facebook and click on the map and it should bring you directly there. There's also ample parking space right in front of Menara Lien Hoe, so do not worry - it is also free as of now. It says 'Loosen Your Tie', but I ain't got no tie. Some photo taking before the commencement of the night. Entering CHAZE, a speakeasy concept bar in Menara Lien Hoe. Of course they would have a ping-pong table, because why not? Guest can play a game or two (or hog the whole table for hours) here at CHAZE. 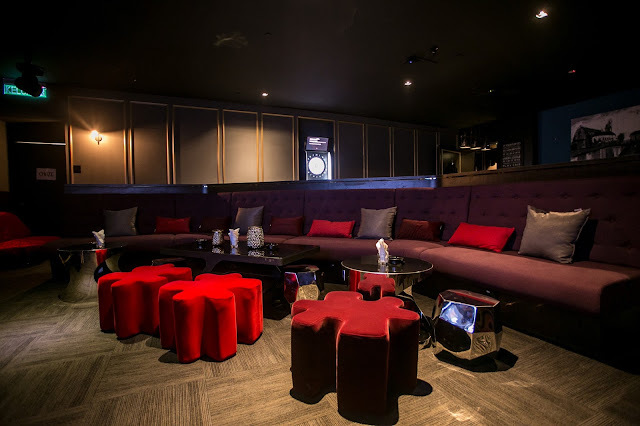 There's also a VIP room with a pool table, darts machine and karaoke with a 60' (or possibly bigger) TV. Yes, you heard that right, a bloody huge screen with full surround sound for that added awesomeness of karaoke. 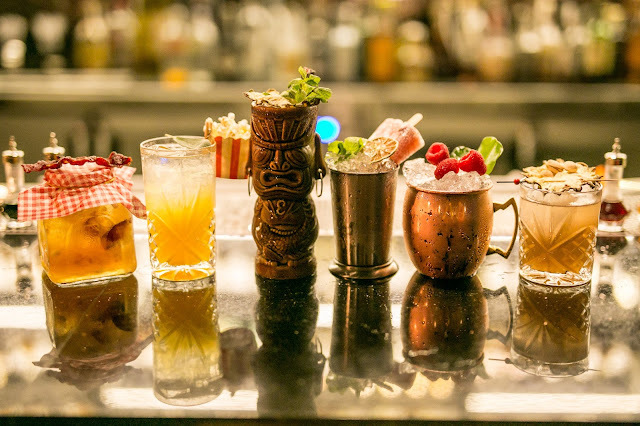 In CHAZE, you'll be exposed to a wide variety of custom-made premium cocktails and mocktails. Of course, for those who prefer single malt or whisky, they have it too. But do not miss out on their exquisite range of highly addictive, and stunning-looking cocktails. A sweet and balanced concoction of oaky bourbon, Jerry Thomas Bitters, Cockburn's Special Reserve ice pop, lime juice and mint leaves, all served in an icy cold, steel cup. Among so many, this was by far my favourite. The subtle and smooth bitterness along with a tinge freshness and sweetness worked really well. Not forgetting the icy pop, as it melts overtime, adding more and more juice to the drink itself. It may not look like much but the flavours were really something. A smooth and rich concotion of Southern Comfort, Vermouth, Old Time Aromatic Bitters, Sprite, Apple and Lime Juice and finishied with a sliced of crispy beef jerky for pairing. You might have already known which is the Ooga Booga by now, as I believe it is fairly obvious. In any case, it is an awesome combination of Spiced and Brazilian rum, Pimm's No.1, Pamplemousse Rose Grapefruit liqueur, orange and apple juice, finished with baked apple bitters. The mix itself was great in many ways, as the flavours intertwines and dances in your mouth. Apart from drinks, they also have a range of highly addictive and delicious sides. This bucket of chicken wings was not only fried to crispy perfection, but was seasoned and marinated with a good heap of flavour as well. Served with a dip on a side - their chicken wings comes highly recommended. If you love McDonald's chicken nuggets, than you'll love this even more. Amazingly, the chicken nuggets were absolutely tender and juicy, while packing in a whole lot of flavour from the breadcrumbs itself. Words cannot describe how amazing it simply is, especially when it comes with a side of dipping sauce, that works just as great. What better way to enjoy your standard serving of crispy and starchy french fries if it isn't sprinkled with truffle oil? This amazing yet simple concoction of fries, truffle oil and a side of homemade dipping sauce certainly is well worth the try. In fact, it could probably be one of the best truffle fries in PJ. Last but not least, a thin-crust mushroom pizza, done with 3 different types of mushroom, cheese and a tangy tomato base. The pizza itself may not have been the smokiest, but the flavours are definitely up to standard. The sauce, mushrooms, cheese and crust all worked really well and is possibly my favourite pizza in all bars. All and all, CHAZE at Marquee is more than just a bar. It is a place for relaxation, stress-relief, good food and awesome drinks. You'll be surprised at the quality and thought placed into their range of food as I was, along with their amazing drinks, there is no better way to let loose yourself after work.